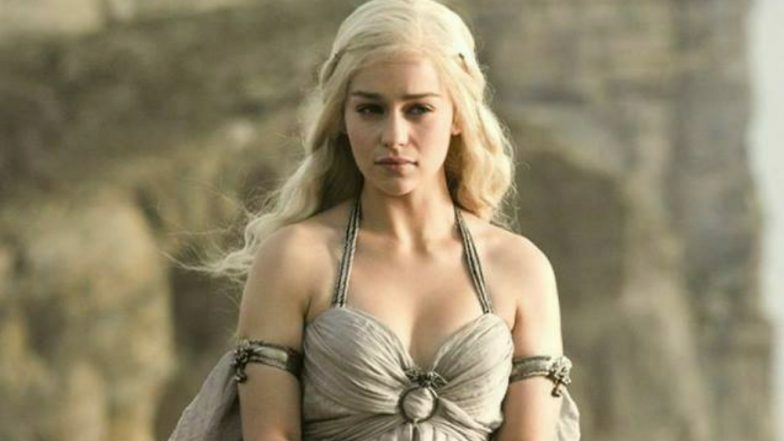 Los Angeles, April 10: "Game of Thrones" star Emilia Clarke has released unseen photographs taken during her recovery from a life-threatening brain aneurysm in 2011, when she was just 24 years old. Earlier this year, the star opened up about how she suffered and survived two brain aneurysms while filming the fantasy drama, the second of which nearly killed her. Clarke, now 32, made an appearance on "CBS Sunday Morning" where she recalled the dark place she went to after her surgery, and shared images from her hospital stay, reports dailymail.co.uk. Game Of Thrones Season 8: Emilia Clarke, Kit Harrington Make Stunning Appearances, Fans Rejoice as 'Dead' Characters Come Alive at the New York Premiere - View Pictures! Discussing the impact it had not just on her physical health but mental well-being, she said: "The first time it was difficult, with the second one I found it much harder to stay optimistic. (I coped with it as a) a day-to-day thing. I definitely went through a period of being... down - putting it mildly." In one of the photographs, the actor is lying on a hospital bed holding her phone, with the red dragon sigil for House Targaryen visible on the back of her phone case. In another image, the star is looking at the camera with a medical tube attached to her head. The actress explained that when a part of your brain is starved of blood for more than a minute, it dies, which is what happened to her after her second aneurysm. During the interview, Clarke also admitted what it was like to return to the set after her brain haemorrhage which happened after filming season one of the show, which is aired in India on Star World.